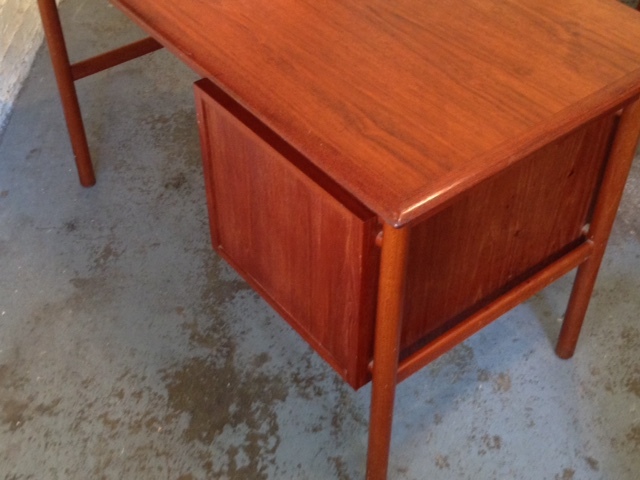 This piece is in great condition with very few signs of age and wear. 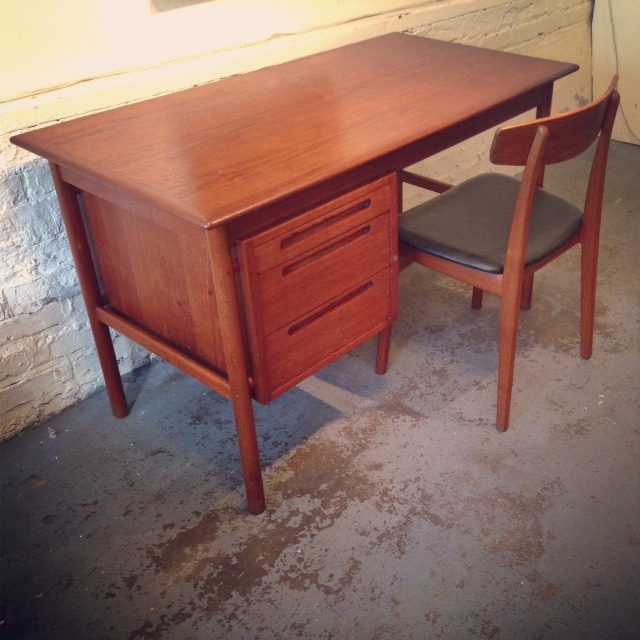 It features a pull-out desk top, plenty of storage, an amazing wood tone, and beautiful lines! 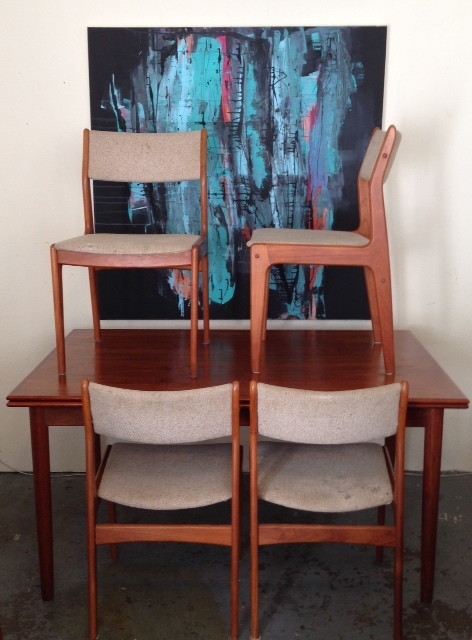 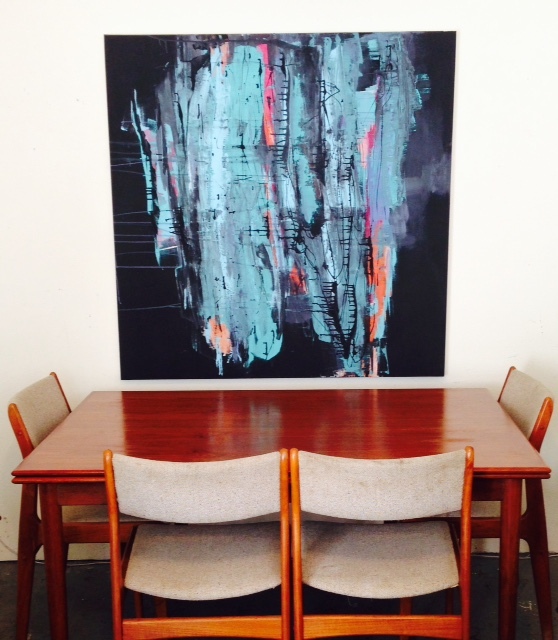 Vintage 1960s Danish Modern teak dining table with four D Scan Chairs can seat up to six comfortably. 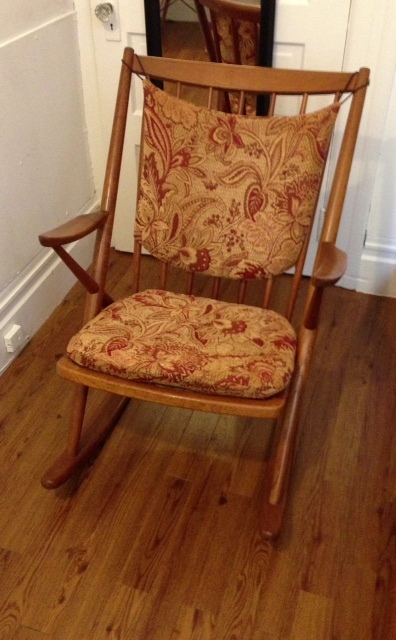 Narrow profile, perfect for city apartments or homes with tight space. 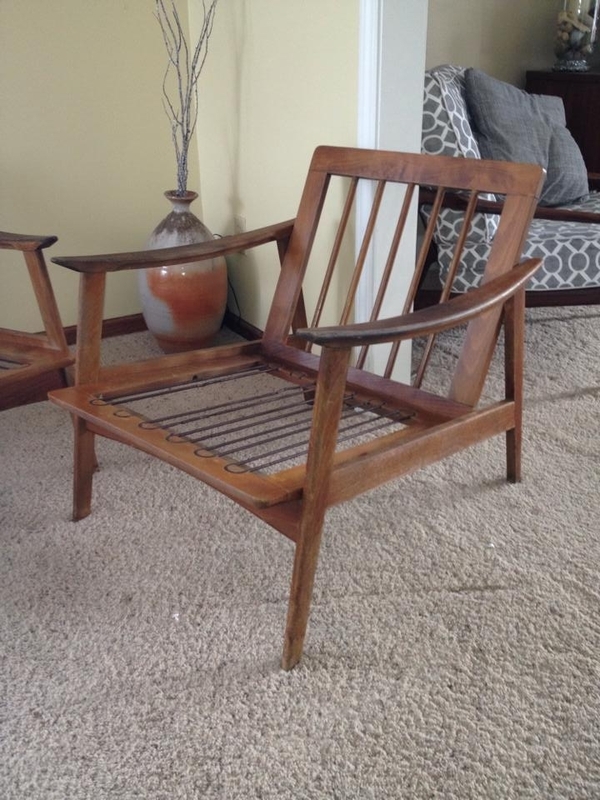 Beautiful patina to the teak wood. 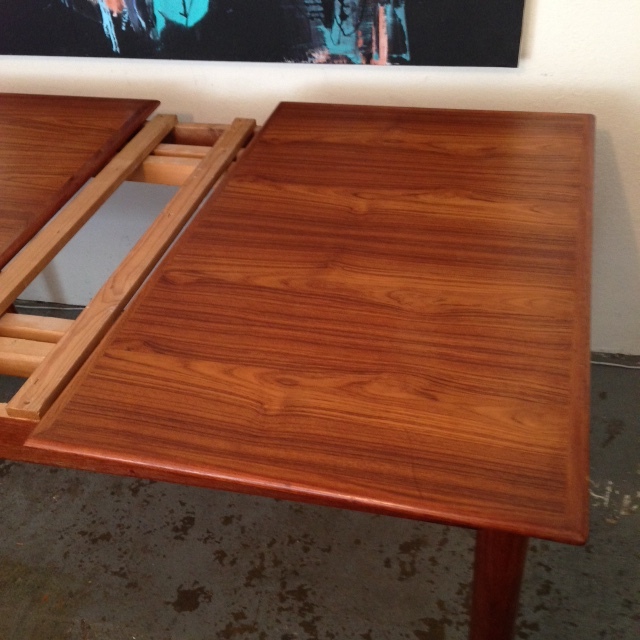 This table features two two 18″ leaf extensions flanking the left and right sides. 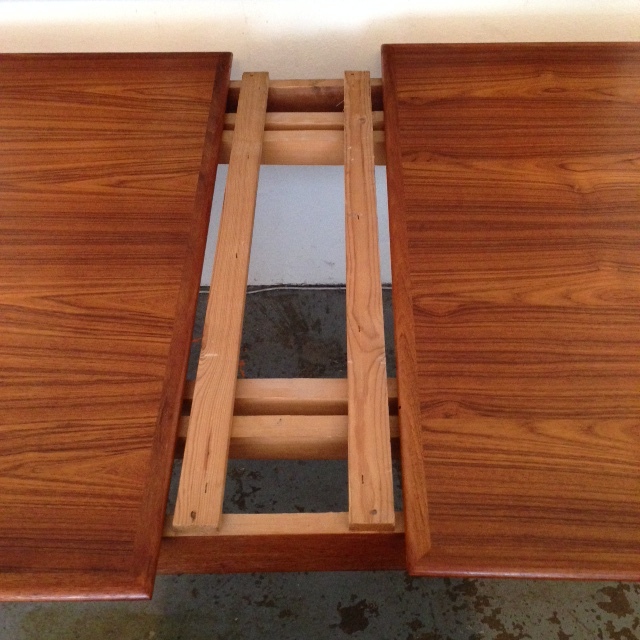 Slide these two extensions underneath the core of the table top for easy storage. 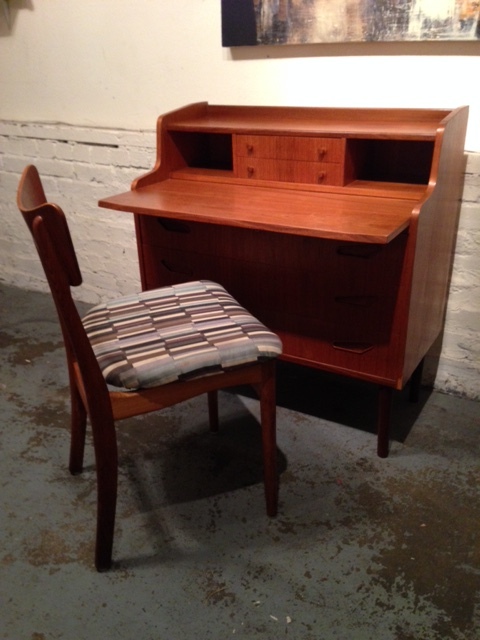 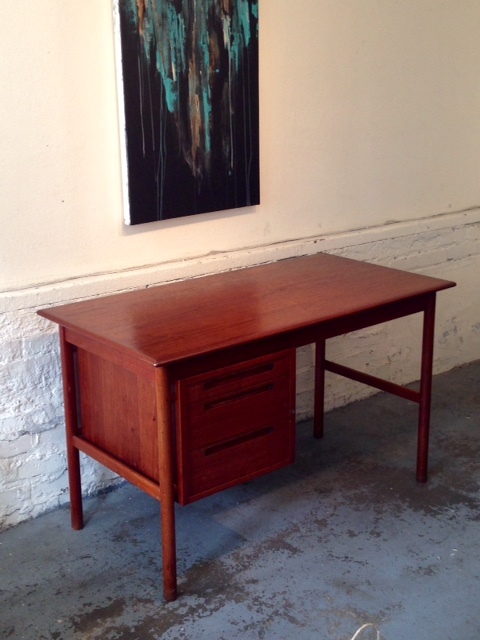 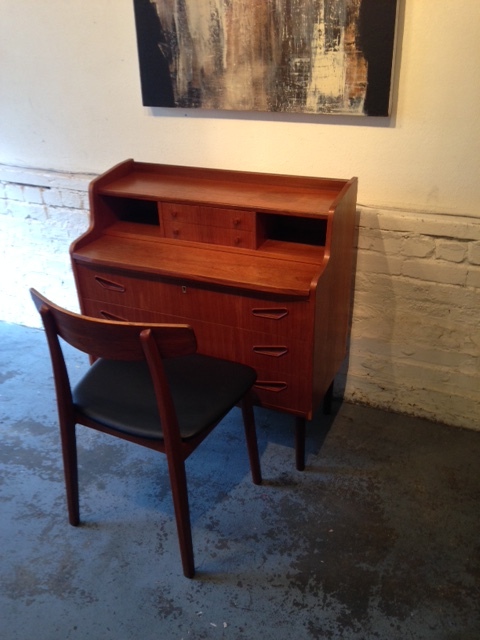 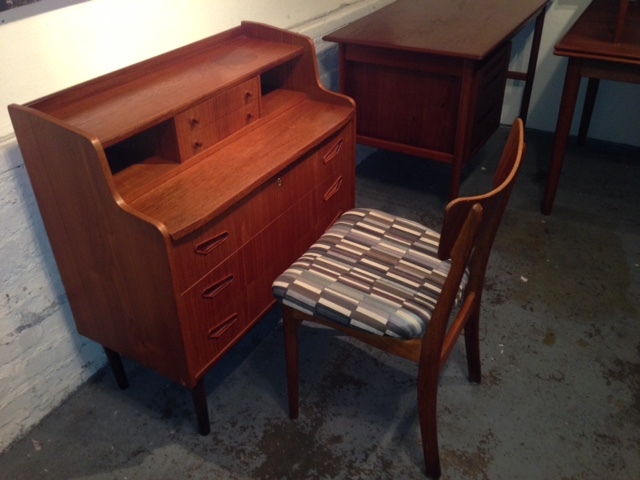 Sleek and handsome Danish Teak Desk in the manner of Peter Lovig and Bruno Hansen Chair with black vinyl seat. 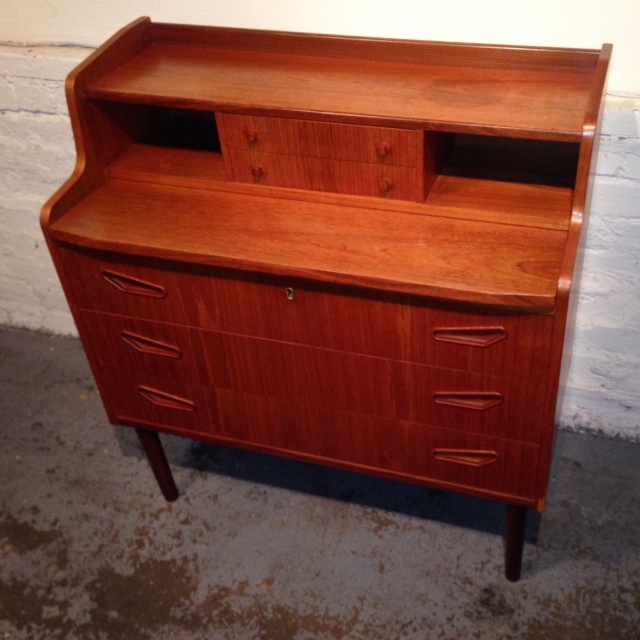 Beautifully kept ,and in great vintage condition. 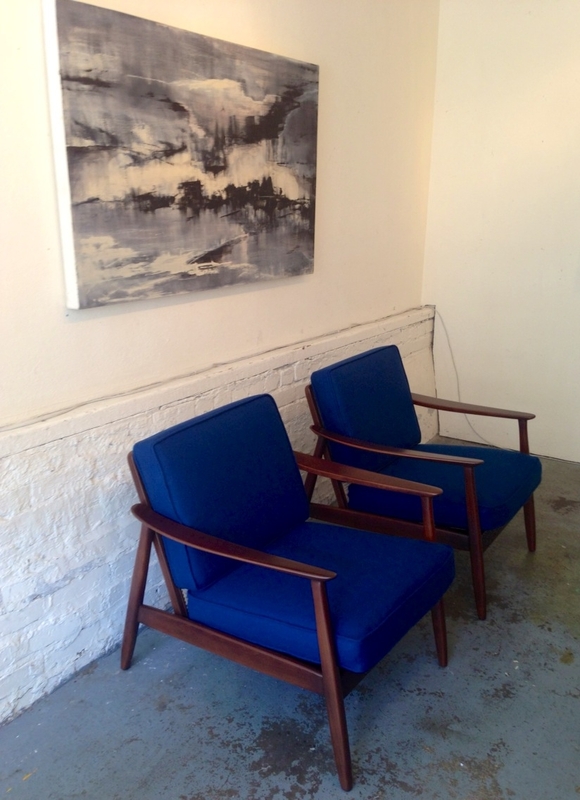 Would most definitely add to the apartment or home of a interior design enthusiast. 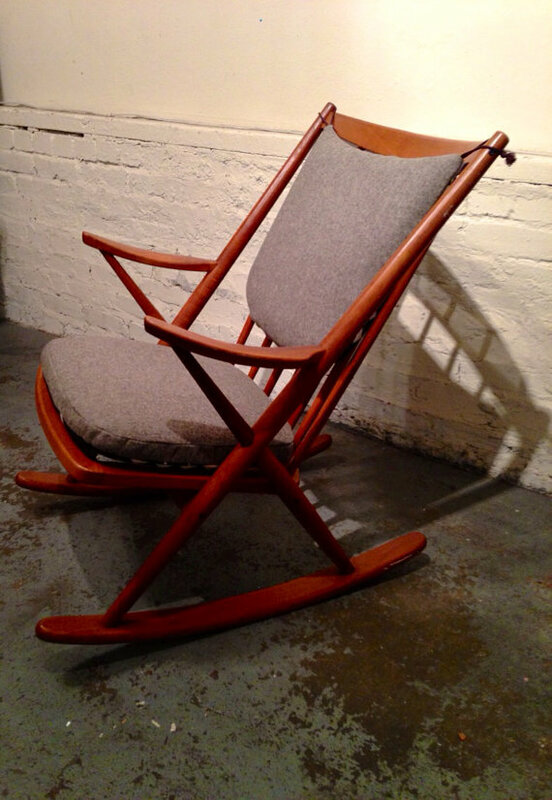 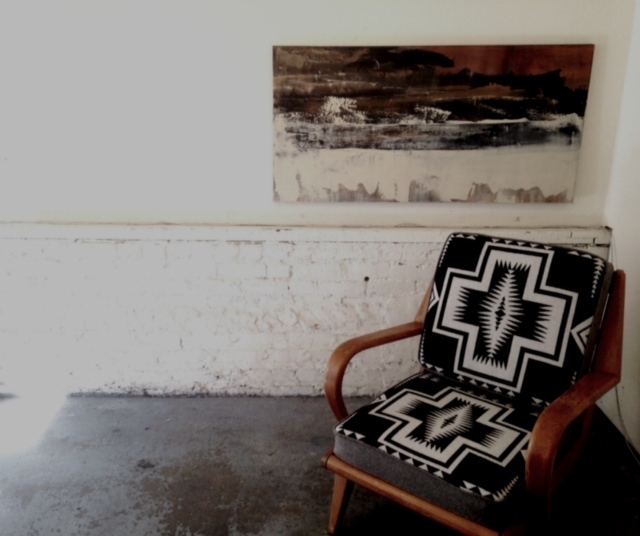 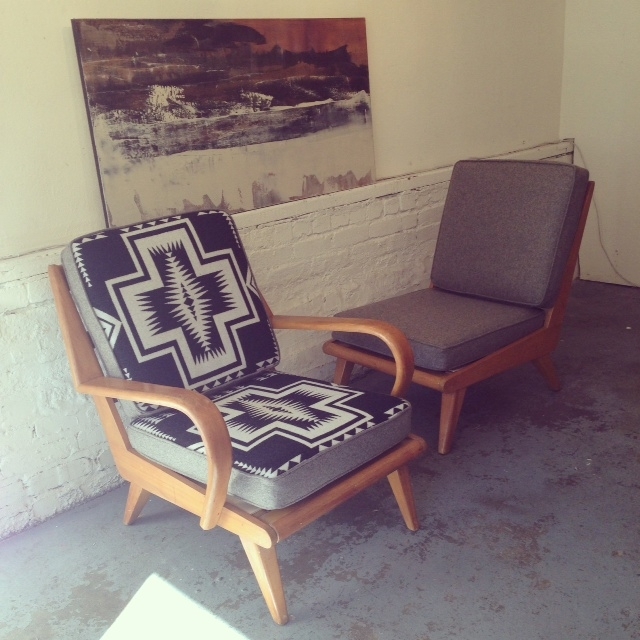 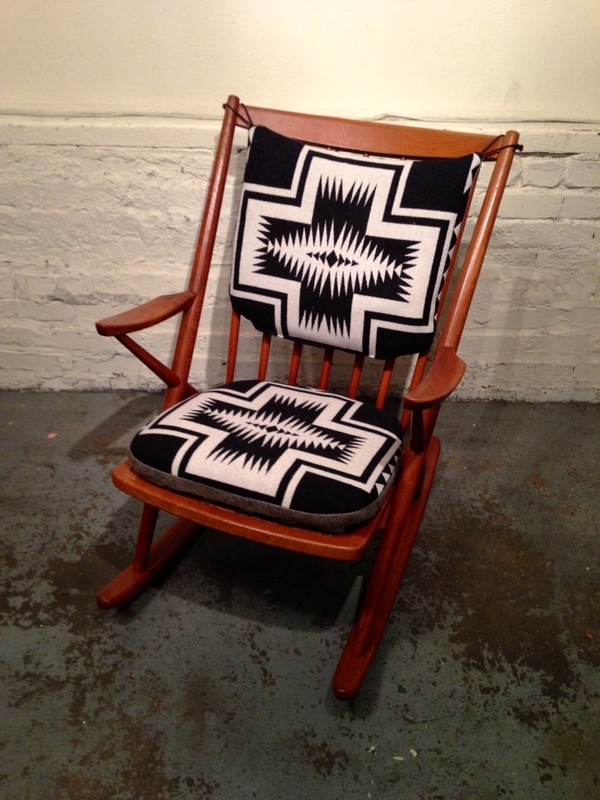 A few months back we purchased this gorgeous teak Frank Reenskaug for Bramin rocker in excellent condition, the cushions just needed a face lift…with some gorgeous Pendleton fabric, check out the flipside. 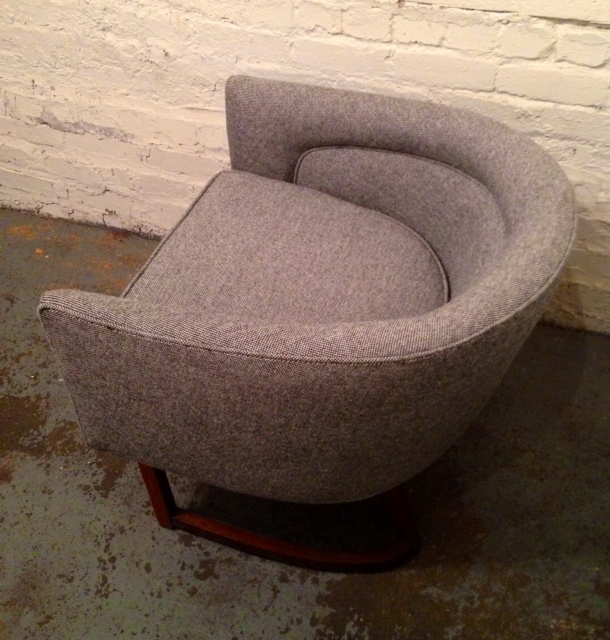 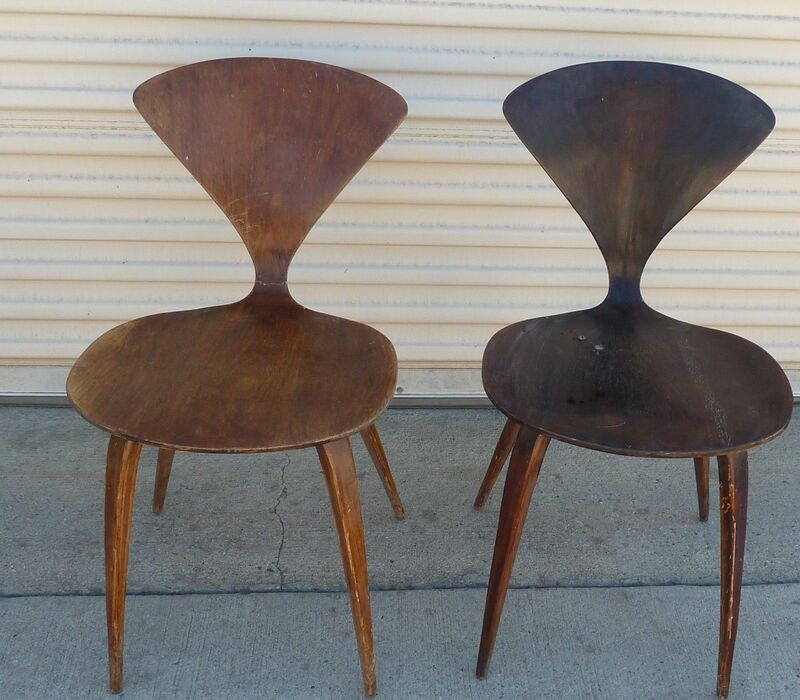 Remember those 1960’s Barrel Chairs? 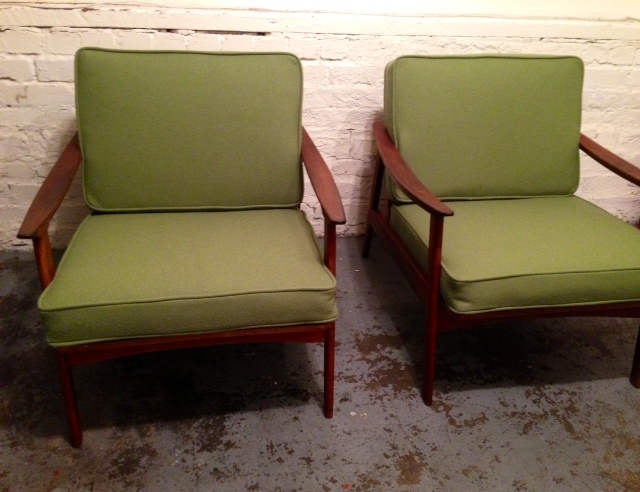 Remember a few months back when I posted those Mid Century Club chairs in a tattered sea-foam green silk fabric? 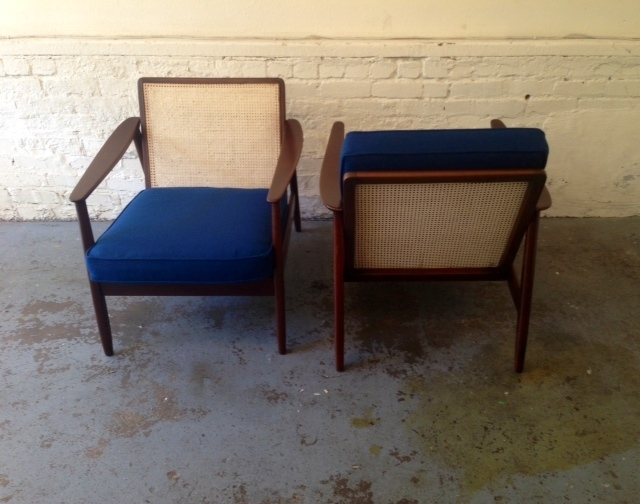 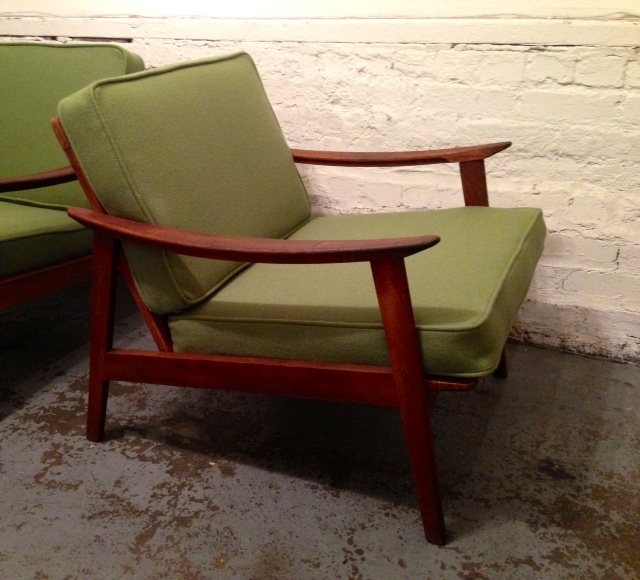 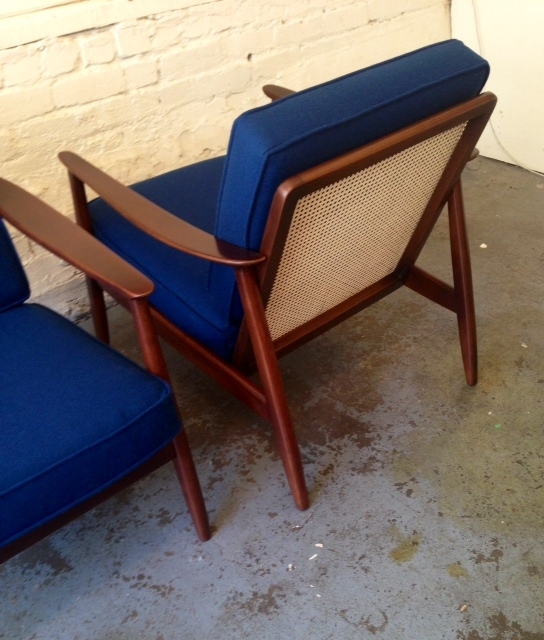 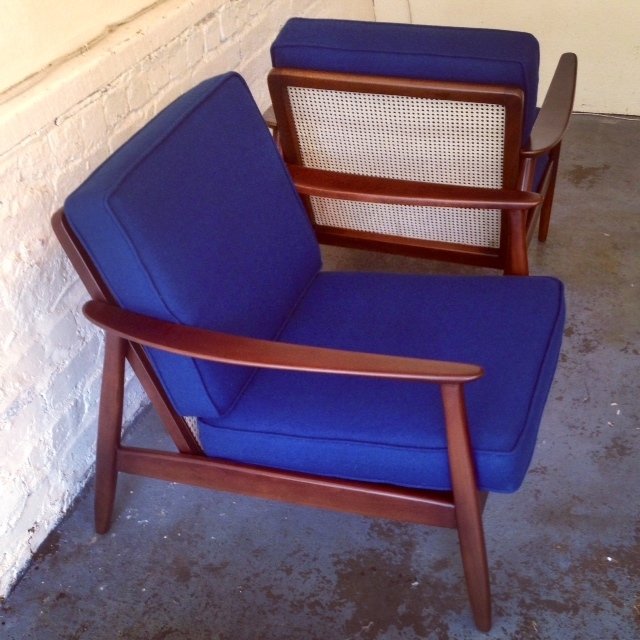 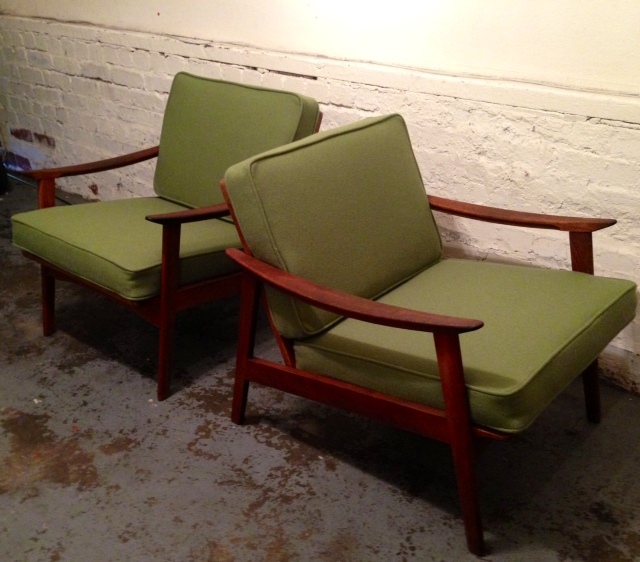 Well here they are completely stripped, gutted and restored in non other than Maharam Hallingdal fabric. 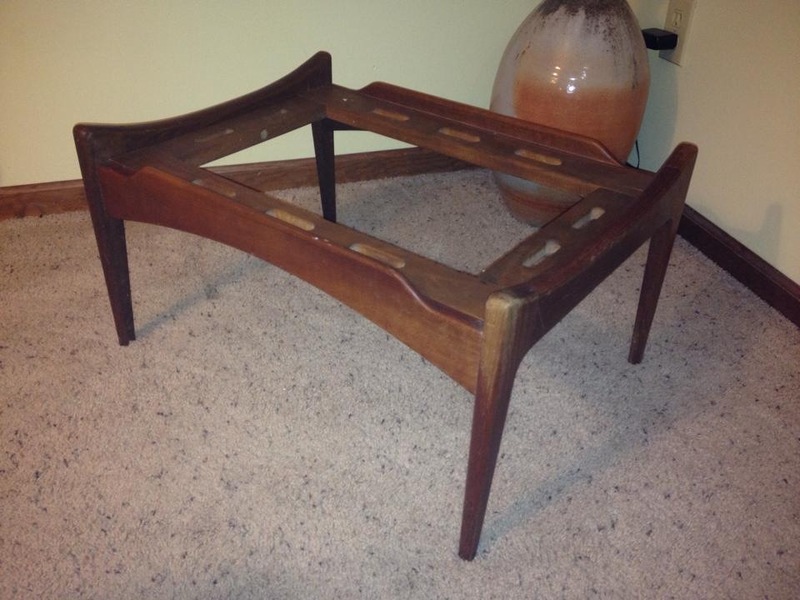 When I was home for the holidays this past year, I picked up an entire Davenport set by Heywood Wakefield during one of many of my thrifting adventures of the season. 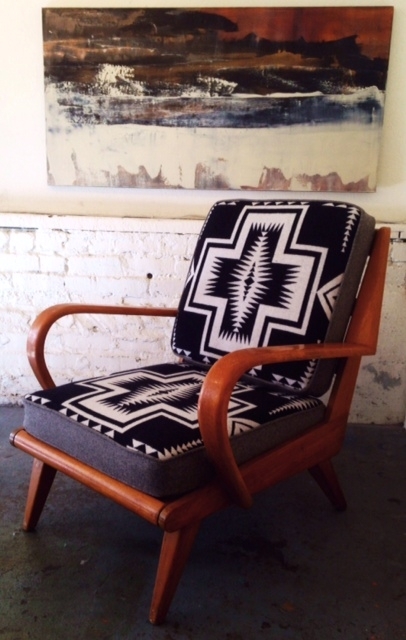 I knew I wanted to do soemthing different than my usual to add flare, and compliment those gorgeous arms, so I had the face of one chair upholstered in Pendleton fabric and I could not be more pleased with how well this project turned out! 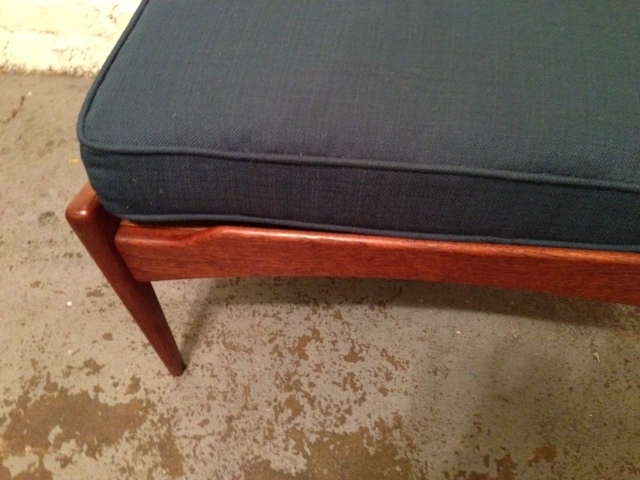 The matching loveseat will be up next, most likely later this spring…I still have to get it shipped from the Midwest. 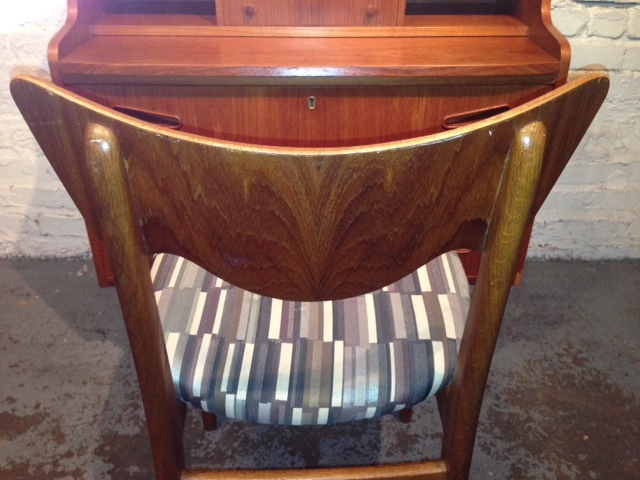 Originally covered in black varnish when purchased. 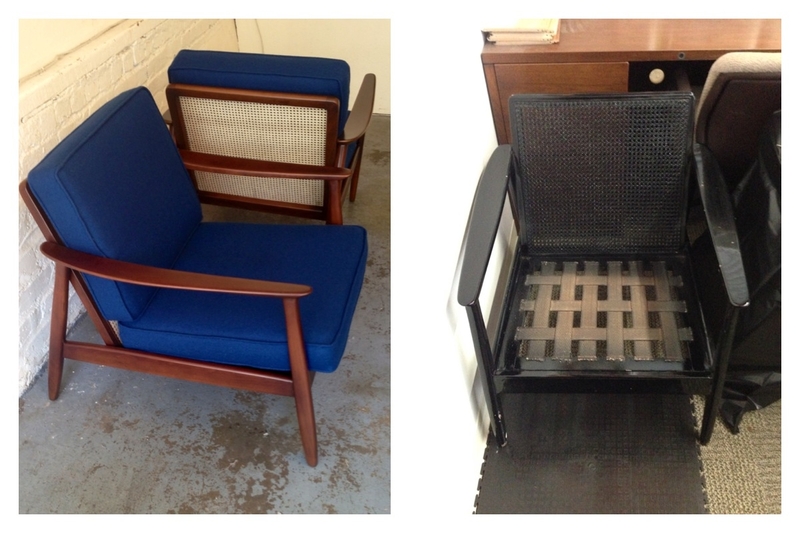 These chairs were loads of work and tons of prep, too much for my work load. 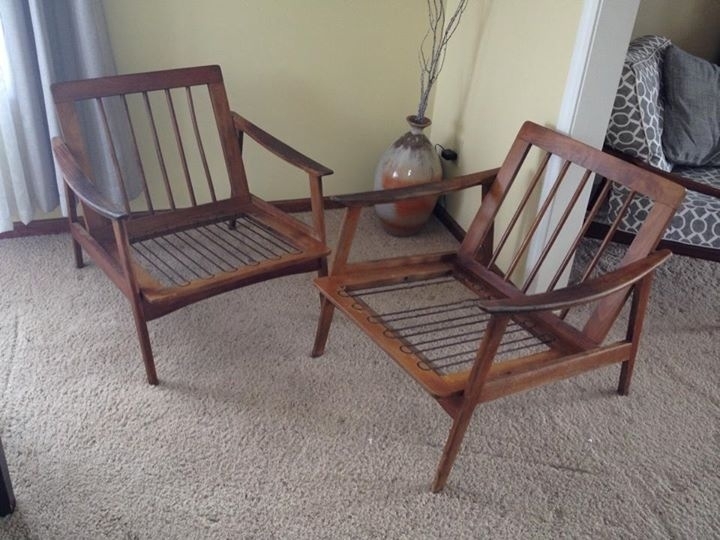 So I outsourced these to my go to Furniture Refinisher, Marty. 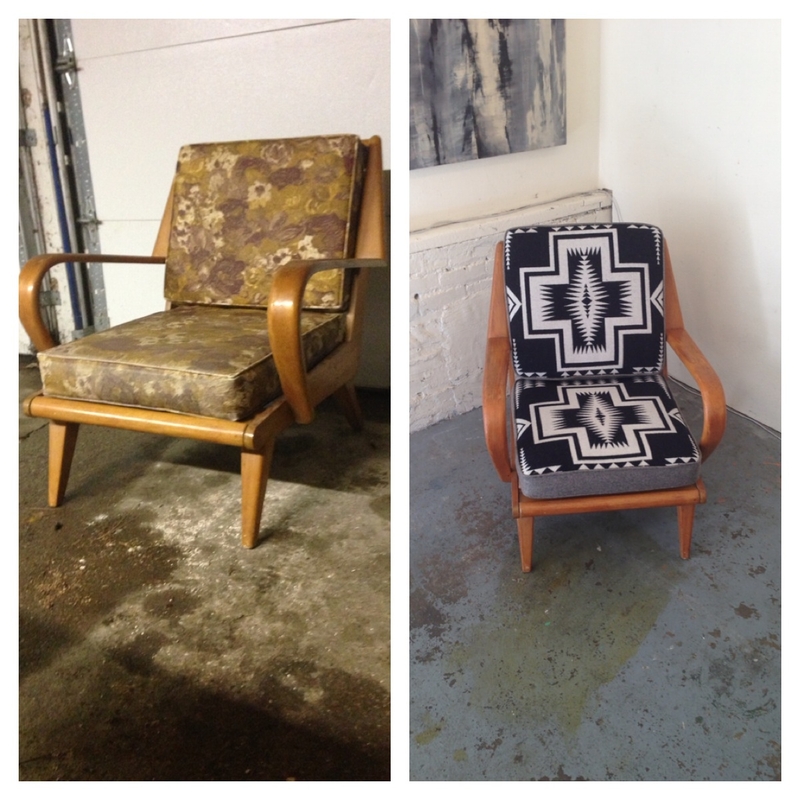 He did an amazing job bringing these back to life! 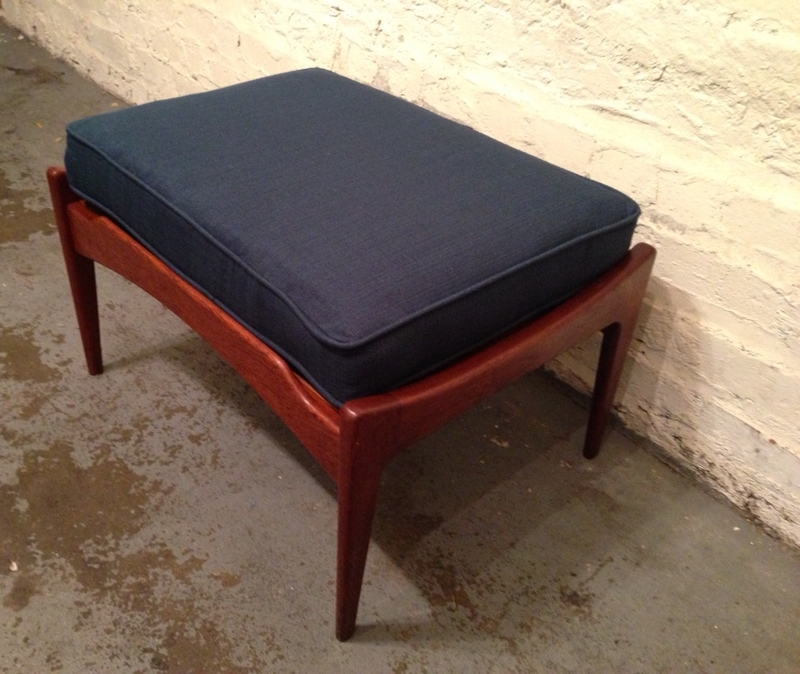 Refinished in a rich walnut stain, clear satin finish, with new caning and new upholstery, both foam and a Cobalt Blue wool fabric. 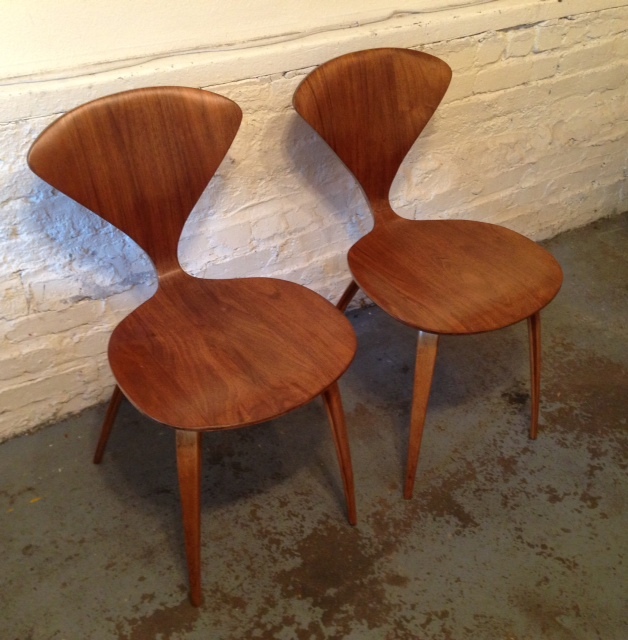 This pair is ready to go for another 50 years! 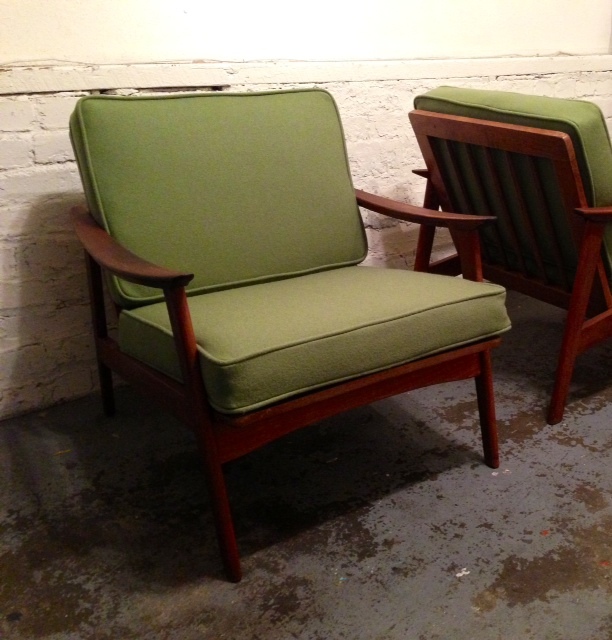 Picked up these 1960’s club chairs from a nice home in Orinda, CA last week. 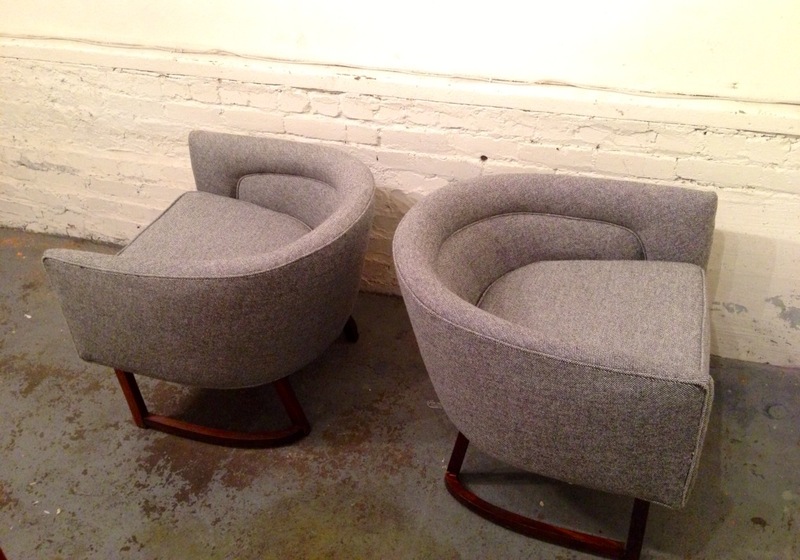 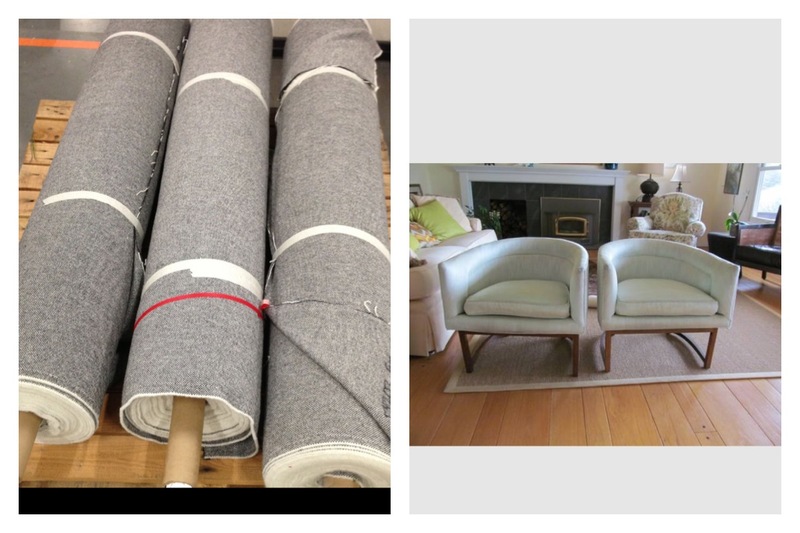 These are going to look great in their second life recovered in Maharam’s Hallingdal #126 Grey! 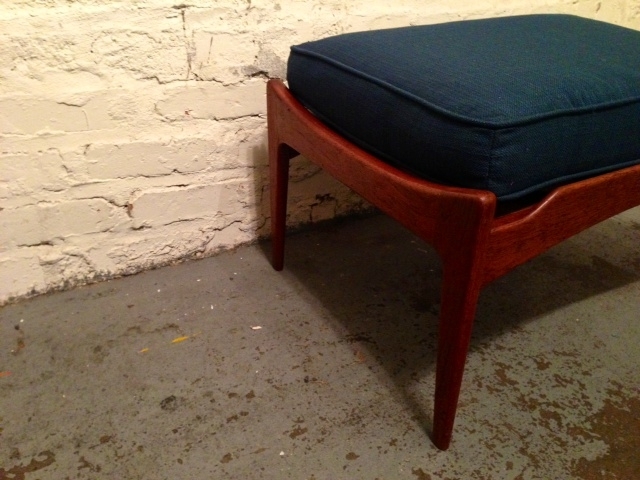 Keep your eye out in a few weeks for the finished product! 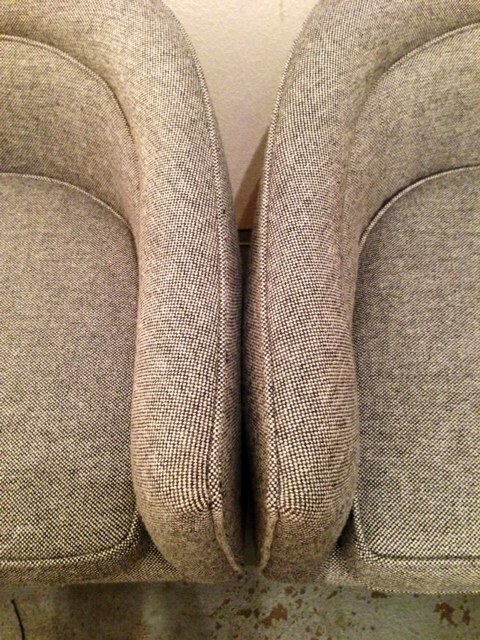 Refreshed with new cushions to boot!